Gardening in South Texas can be challenging. The soil in most places is hard, the wind blows, some years it rains and some it doesn’t. Showing that you can deal with these realities and still having a beautiful landscape is one of the objectives of the Water District’s Water Wisely Demonstration Garden that opened in January at the San Patricio County Fairgrounds. The initial phase of the garden was ready just in time for the annual San Patricio-Aransas Counties Agricultural and Homemakers (A&H) Show with its hundreds of young people showing their livestock, craft and homemaking projects for judging and auction. 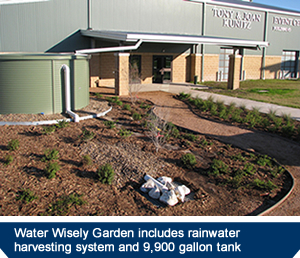 The Water Wisely Garden is an educational experience showing examples of low water demand native plant landscaping and the concept of medium scale rainwater harvesting. For some ideas on how you can employ rainwater harvesting and raingardens in your landscaping look here. The fairgrounds garden, located at the front door of the Tony & Joan Kunitz Event Center, is the result of more than a year of planning that involved the Water District staff and a host of volunteers and contractors. The San Patricio/Aransas Master Gardeners assisted with plant selection and overall garden design which includes pathways of decomposed granite and stone benches. The initial plantings in the garden include natives such as Lantana, Gulf Coast Muhly (grass), Mexican Mint Marigold, Prairie Sumac, Texas Mountain Laurel, St. John Bottlebrush and Texas Persimmon. Signage will be added to describe the plants and to add to the water conservation learning experience. At the center of the main garden is a 9,900 gallon rainwater harvesting storage tank. Standing atop a six-inch sand pad, the tank is 7 feet tall and just over 15.5 feet in diameter. The steel shell holds a flexible polymer composite water storage liner. Rainwater falling on a small portion of the huge Event Center roof is channeled to a rain gutter and then to a downspout that delivers water to an opening in the top of the tank. The garden also includes a large storm drain inlet that can handle heavy rainfall on the garden and any overflow from the tank once it is filled. Rainwater is delivered by gravity to the garden through a low-flow drip irrigation system made up of flexible tubing, drip lines, emitters and spike bubblers. This system sets atop landscaping cloth and is covered with layers of mulch. As a backup, the system is plumbed to connect to the municipal water supply system when no rainwater is available. Karen Ivey, who has been managing the District’s garden project, said that like any landscaping project there have been some setbacks including not being able to immediately obtain some of the plants specified in the original garden master plan. More plants will be added as the garden has a chance to become established. A second garden is being planned a couple of hundred feet to the west. A second green rainwater harvesting tank has been installed there to capture rainfall from the roof of the main Arena Building. The tank will provide water to a future linear native grass exhibit to be installed by the Texas Agrilife Extension Office in Sinton. It will be developed along the walkway leading from the main fairground parking lots to the Arena and Events Center. Rainwater is carried to the tank through a 6-inch standpipe which starts at the building downspout then runs underground across the courtyard before coming up and into the top of the tank. Plants and landscape materials for the initial phase of the Water Wisely Garden were purchased through Greens ‘n Things of Taft-Portland. BlueScope Water of Austin was the contractor supplying the two Pioneer water tanks. Rainwater tank was assembled on site in a single day. Installation of drip irrigation system water feed lines and flexible tubing. Drip system winds through planting beds. Garden includes stone benches and crushed granite pathways. Native plants were selected to show how they can be used locally. Rainwater collected on the Event Center roof travels by downspout to the storage tank. A second 9,900-gallon tank will provide water to a native grasses exhibit.